The troika – three horses harnessed abreast, typically pulling a sleigh – is one of the main symbols of Russia. The combination is unique both in the art of training the horses and the driving style needed to manage them. Master driver and 8-time champion of Russia Andrei Korchagin says that this means of transport allows foreigners to get a feeling for the real Russia. "People say Russia is matryoshki and vodka. That’s not all – there’s also us!” Master driver and 8-time champion of Russia Andrei Korchagin is harnessing a trio of horses with the help of his wife and son. “There she is, the real Russia, see,” says Korchagin. The horses, black and glossy, shake their heads mischievously, and it seems that if you only let them go, they would run straight off into the field. "Come on, quickly into the sleigh!” orders Korchagin. “If you don’t manage to sit down, they won’t wait!" The Heritage Russian troika center, created on the initiative of Korchagin and Moscow lawyer and horse lover Yury Rybakov, keeps genuine equine athletes in its stables. The troika is a uniquely Russian style of harnessed driving, using three horses abreast to pull a sleigh or cart. The center, which is located in the Vladimir Region east of Moscow, trains horses from the Orlov Trotter breed for prize troika competitions, and also features a training school for athletes and amateurs in working with horses in Russian harnesses. Troikas traveled back and forth on the dirt road connecting Moscow and St. Petersburg, covering the distance of roughly 750 kilometers in about a week. With the introduction of stagecoaches in the 1820s, the travel time was reduced to between four and five days. Everything is being funded by Rybakov, and while the center is not yet making money, he says that profit is not his primary aim. 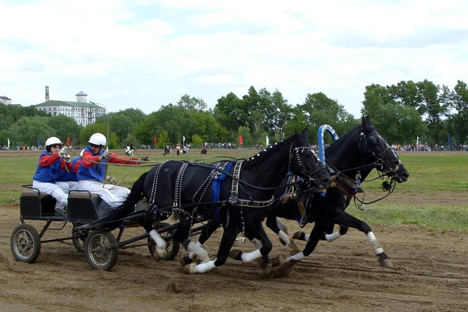 “Our task here is to preserve the native Russian traditions of harness driving,” he says. Rybakov dreams that one day the Russian troika championships will become a kind of “Formula One” of the field, the sport will receive state financial support, and Russians will finally understand: the troika is worthy of being called the main symbol of Russia. Korchagin has been involved with horses for almost 30 years, a hobby that began when he was still in veterinary college. “One day I was at a championship and saw how the troikas were flying past! They sent shivers down my spine! I decided to work exclusively with them and go away to study the art.” While he was studying, he had only enough money for the hotel and tea with crackers. Korchagin is always ready to make sacrifices for the sake of his favorite occupation. Once he had to travel to Paris to perform in a troika at his own expense, and he sold his car to fund the trip. “So what? Today we have money, tomorrow we don’t. But it’s necessary to perform, it’s all about the prestige of Russia,” he says. The Russian troika is generally considered to have first appeared about 200 years ago, though according to Yelena Peterson, the keeper of the museum at the Moscow Hippodrome, the harness combination has a history stretching back around 500 years. The troika is the world's only harness combination with different gaits: The leader runs in a trot and the trace-horses at a canter. In a team like this, says Korchagin, every horse is important: "Each of our horses knows where to go. This isn’t like in the case of a European harness for four horses, when any horse can take the place of another. No, we have an individual approach. “That’s why I try out my horses for months in order to work out which spot is more comfortable and interesting for the animal. If it pulls to the left like a left-hander, then you need to put it to the left." Nobody understands yet abroad how Russian drivers manage horses running at a different gait, says Korchagin. One day some Europeans came to Korchagin for an internship. “They spent two weeks with us here, learning to harness and do show riding. Among them there was one Belgian, quite an experienced rider. So, I liked him and suggested he perform alongside me at the Russian championships. “Well, he was so happy! I explained his task: to hold the reins of his trace-horse, and then give them to me. He nodded. We set off, with him sitting behind with my assistant, everything was calm. But when the race began he fell into a stupor. I tried to take the reins from him, but he wouldn’t release them. So I shout to my assistant: "Help!" Together we barely managed to avoid a fiasco and came second. The Belgian had turned white. "It's because of me," he said, almost crying, "I took such a deep breath at the start that I let it go only at the finish, I was so frightened." He had no idea that it would involve such high speeds. This is why foreigners do not understand the philosophy of the Russian troika. They think that it's just three horses abreast. But the troika is a bird! First pubblished in Russian in Kommersant-Ogonyok.